“The World’s Favorite Airline” British Airways has confirmed a data breach, compromised personal information and credit-card numbers of up to 380,000 customers. 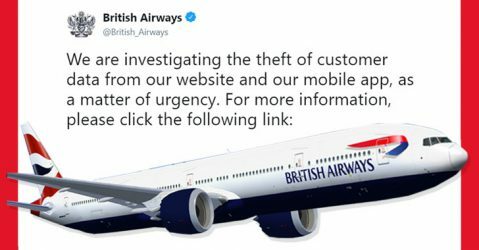 Between August 21st to the 5th of September, customers who booked flights on ba.com or through the mobile app of British Airways had their information exposed. The 15 day period of compromised information leaked personal details including customers’ names, addresses, and financial information. British Airways noted that passport numbers, travel details, and saved payment cards were not compromised. Only the cards that were used in the timeframe to make booking payments were exposed. Data Breach? Or Data Theft? It was confirmed that 380,000 payment cards were disclosed, but the statement did not reveal the number of affected customers. It was also unclear how the data breach happened. Some media outlets have proclaimed that a third party noticed some suspicious activity and alerted British Airlines. Other sources said that “this is data theft, rather than a breach,” implying that someone with privileged access to data may have stolen it. British Airways confirmed that the security breach has been resolved. The website and app are now working properly and safe to book and manage flight information.